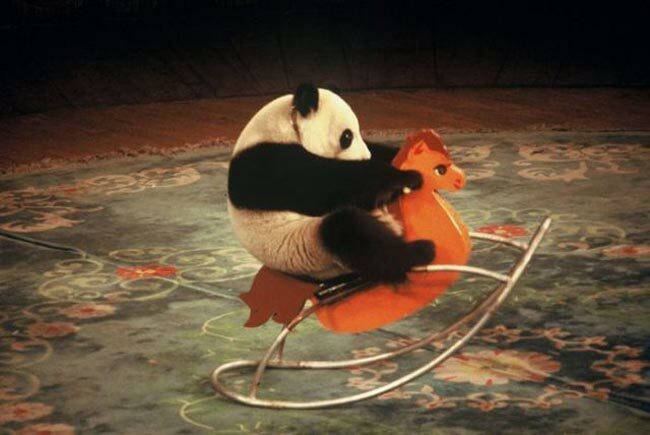 Here, have an incongruous photo of a panda on a rocking horse. This made me laugh so much, it was ridiculous. Isn’t it surreal? Even the colours. In any case, block week started off very intimidatingly but ended with a whimper. While it has sent home the message that I am very much unprepared for final exams (by my personal expectations), it wasn’t like I was dumb enough not to see that anyway, so all in all, this week has been only marginally useful. At least I’ve mostly sorted through all my notes. For history, that meant shamefacedly realizing that Seb’s notes were pretty decent, and I might have gotten more out of his classes if I had read more on my own time, but – it was still the lack of a general interest in history that demotivated me. It was great not having to go to classes, though. I find myself a far more relaxed person when I don’t have the obligation to sit through what essentially amounts to a whole morning of inanity. Block Week has also made clear how inadequately these classes have prepared me for the exams, but I’ve worn that topic out many times over, so I shall desist for now. Still struggling with my feelings towards philosophy, though the three papers today didn’t go too badly. Sometimes, though, I wonder if philosophy has instrumental value – it’s funny, I need that as justification, rather than intrinsic value. Clearly, my thoughts are jumping all over the place. I’m recently engrossed in a tour de force, Peter Watson’s A Terrible Beauty: The People and Ideas that Shaped the Modern World. The subtitle’s a little obnoxious, I concede, but the book itself is epically engaging and so erudite and very, very fascinating. It’s so, so exciting reading the snippets about all these people who did what they loved and changed the world in the mean time (and how many of them went to Oxbridge, golly – maybe that’s just selective memory, though), and the tempestuous times they lived in, which makes modern times seem so boring in comparison, but I guess a few decades from now, future generations would say the same thing about us. I never know how to say what I want to do or be in the future, but I want to write books like this that talk about everything important in the world, or find something I love doing that genuinely and intensely makes a difference in something; to fight, in a sense. I know I’ve always had the romantic notion of a university professor floating somewhere in my mind, and that’s still something I would love to do, except everything I read about humanities and scholarship and academia is discouraging. I don’t want to spend a decade of my life filling my resume with conferences and meaningless papers just to try to make tenure or get a PhD … but I’m probably getting far, far ahead of myself. I did promise myself, though, that I won’t pursue academia if I don’t excel in university. That seems like a very obvious statement, though. I’ve eaten two bags of marshmallows this week, but I have also incorporated rowing into my gym routine. Due to the fact that I eat marshmallows everywhere and am also a messy eater, I tend to find single, hardened marshmallow bits in random places, at random times. Last week, I learnt how to roll in a kayak! In preparation for summer. And also rowed out past the prison in Garth’s purple boat in mild waves, which was exhilaratingly terrifying, but so, so great. Rowing is awesome. Quite clearly, I had nothing substantial to say today. US university decisions mostly today, one on Sunday, I think, but who knows? I know at least one person who’s more excited about my results arriving than I am.